Hi everyone! I wanted to tell you about an awesome join promotion that starts on January 3rd and runs though March 31st. 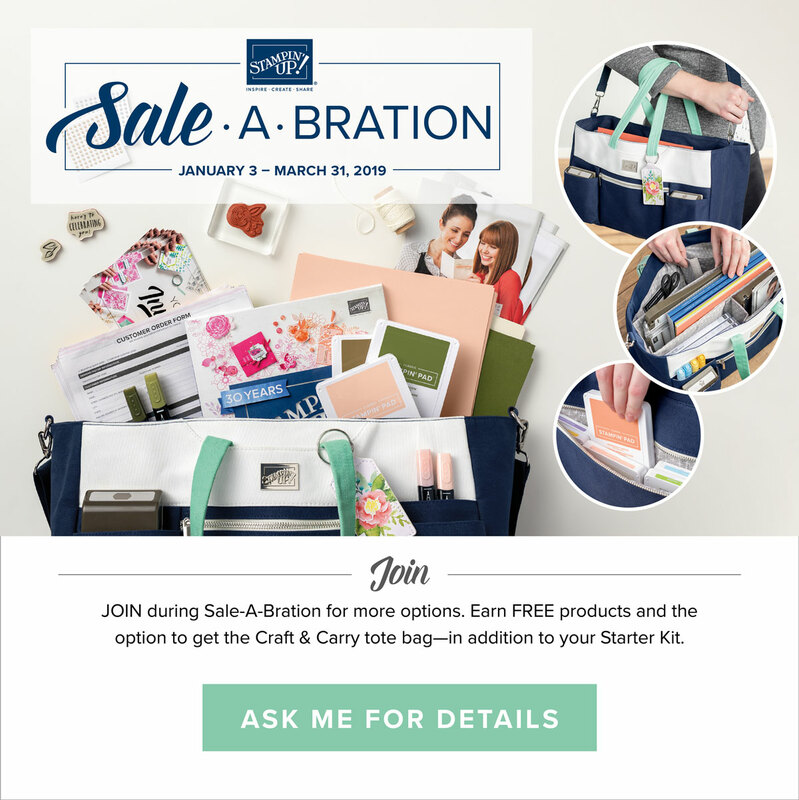 This year during Sale-a-Bration Stampin' Up! is adding $50 more to the starter kits!! 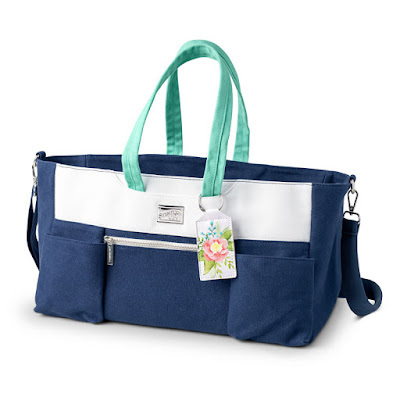 Now you would get $175 worth of products for just $99, and you can choose ANY $175 in products that you want from the annual and occasions catalogs. OR, Option 2 Get $175 worth of products plus an awesome craft tote (valued at $50) for just $129. These are both great deals! There are so many benefits to being a Stampin' up! demonstrator, the discount of great craft products of course, but also the website full of creative ideas and the community of people that will become your friends both online and in person at events or get togethers. Being a demonstrator is a no obligation opportunity and you don't have to buy or sell anything, the great starter kit can be the only thing you buy. We hope you will love staying and getting a discount on future orders, and becoming a member of the Stampin' Up! community, but we understand that sometimes it is not right for everyone. 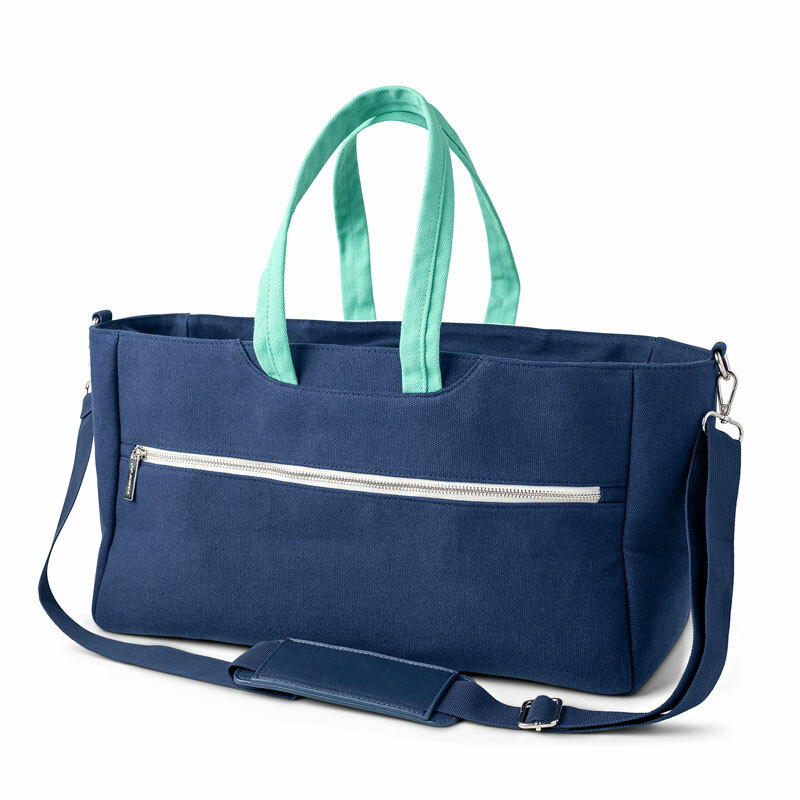 You can drop at anytime and there are no automatic or forced purchases. 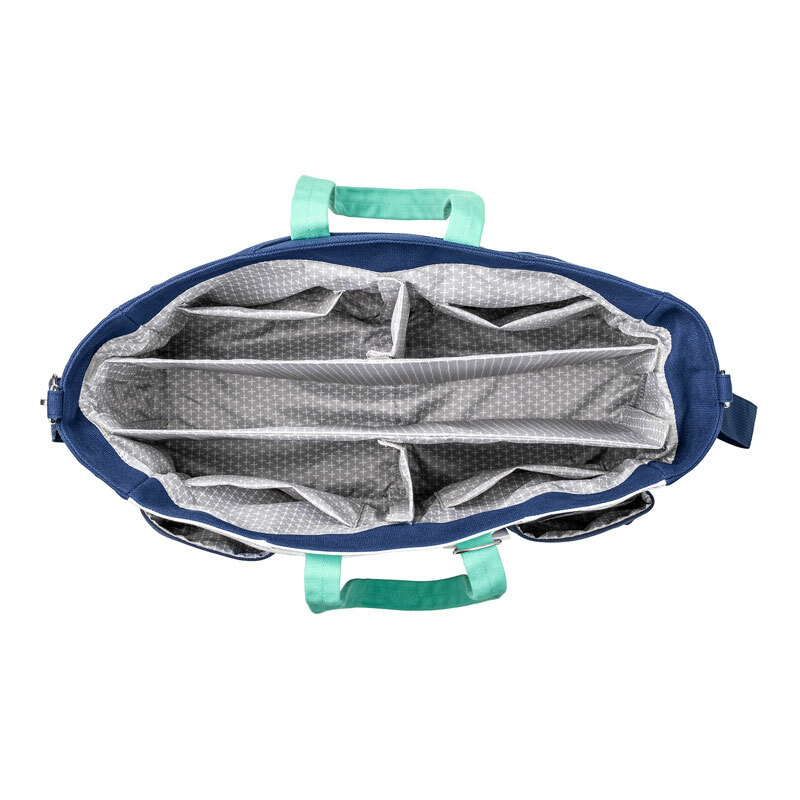 When you join you will also get some business supplies, such as catalogs and order forms. You can use these to pass out to friends and family as you decide weather to try selling in addition to getting your discount. 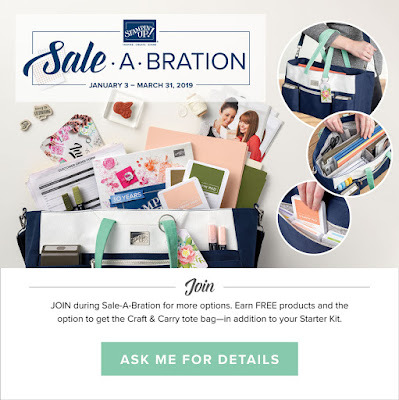 Your discount will start at 20% but will go up to 25% if you make your minimums for a while, and it can go up even more if you decide to sell more to other people via stampin' events, online or to friends and family. You will also get a weekly email with some creative projects to try out, as well as info on current promotions and some business tips. 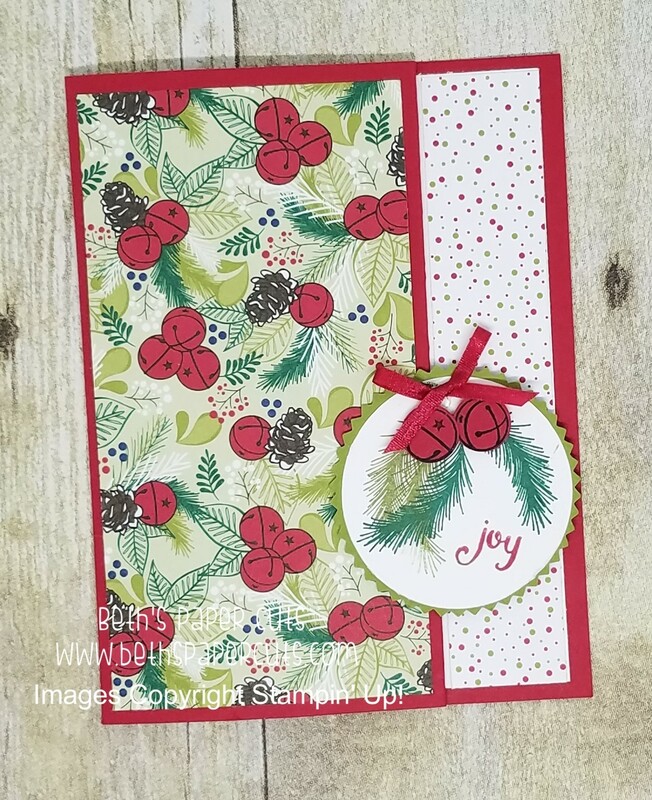 There is also a Stampin' Up! sponsored online community and Facebook page where other demonstrators from around the globe share our ideas and tips and tricks. I also have a team Facebook page where I share ideas and you could ask questions or share your ideas as well. I am available online via Facebook, or messenger, or email, or you can feel free to call me. I am always happy to talk about my favorite hobby! You do not need to live in Illinois, I have team members in other states and keeping in touch is easy online or even in person at the twice yearly Stampin' Up! events. Local team members get discounts at my Stamp Camps as well, and I share templates and ideas freely with my team on my Facebook page. Watch my join video for more info or click the Join my team tab under my blog header and get started. Added join benefits don't start until January 3rd, so use the next few days to figure out what $175 worth of products you want in your starter kit, then come back on January 3rd and join! Contact me with ANY questions. Check out a closer look at that bag! 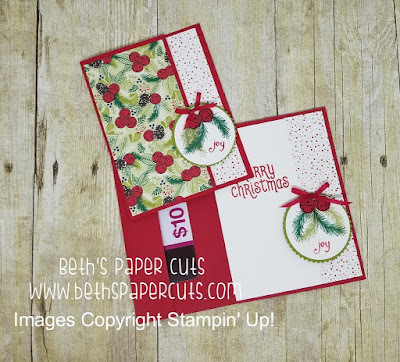 Labels: Beth's paper cuts, Join, promotion, Sale-A-Bration, Special, stamp, stampin up, Stampin' Up! 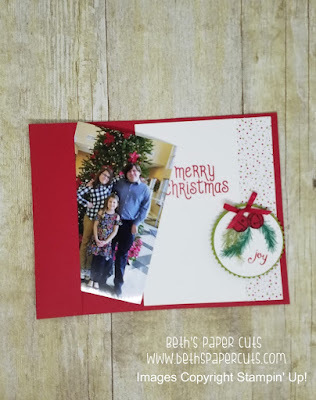 Today I would like to share a quick and simple gift card holder, just in time for Christmas. You can change up this simple design for just about any occasion. This version only uses punches, so it is great if you don't own a Big Shot. 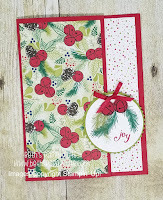 I used the Mistletoe Season stamp set and Under the Mistletoe Designer Series Paper. The base is 8 1/2 by 5 1/2, scored at 1 1/4 and 4 1/4. The 1 1/4 flap is folded in to be the part that holds the gift card. This card design is also great to hold a photo. Photos are great to give at Christmas. Other times would be school photos to family members, new baby announcements, Wedding and more. Below is a video with step by step instructions, with a tip for cutting multiples.